If you are a commercial business owner of a restaurant, resort, venue, workspace, or many others, and you are not utilizing a screened in patio, you could be losing tons of revenue every year. 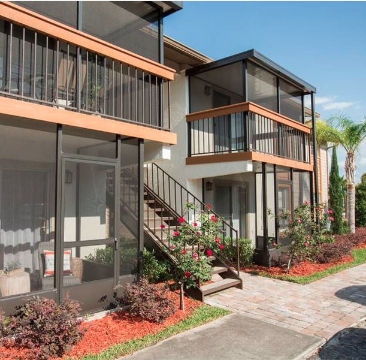 Especially down here in South Florida, it has been proven over and over that businesses offering a comfortable and sheltered outdoor space drastically increase their customer visitations and satisfaction, providing an awesome return on investment. Screen enclosures can be an excellent way to very cost effectively keep up with your business's demand without having to undergo costly and time consuming renovations. Especially in the restaurant industry where number of tables filled and speed of seating customers is crucial to good income and quality service. Screen rooms can help you do this by transforming your previously underutilized spaces outside the building into revenue producing assets. In the venue world a screened area can be a great solution and draw for wedding planners and golf course or clubhouse parties, providing both a peace of mind escape from the often unpredictable weather as well as a comfortable and more intimate environment. 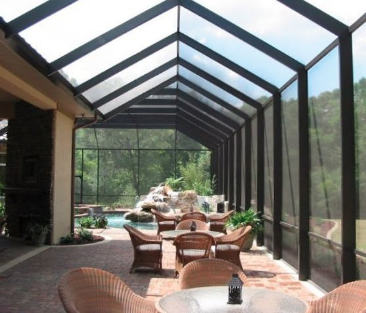 Additionally in the resort industry these enclosures not only provide guests with all the benefits that will keep them coming back like moderated temperatures, comfort from the elements, and privacy, they will also drastically decrease your maintenance efforts as they keep out bugs, plants, animals, and UV rays. Every commercial project is a from scratch custom design made to match any of your unique needs, and is also developed with your vision for overall look, feel, and function closely attended to. 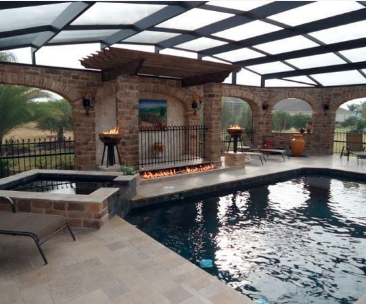 We strive to make enclosures that not only provide tangible value through extra square footage, natural light, and protection, but also compliment the architectural aesthetic and ambiance of your establishment. Every installation at Fort Lauderdale Screen Enclosures is a special and custom manufactured setup, so you will never be limited to stock options, and can instead follow your imagination as far as you would like. Over the years we have amassed such a large portfolio of commercial work we won't cover them all, but some of these have included apartment properties, hotels and resorts, restaurants, church yards, atriums, corporate offices, retail spaces, carports, senior homes, and so much more. We are yet to find a project to unique or large to handle so even if it's not in this list, give us a call and I'm sure we can come up with a solution for you today! We would be happy to assist in all stages of the process whether you are breaking new ground, want a new structure built for an old building, or even need an existing screen room amended, altered, or retrofit. We would love to help you increase your customer flow today by putting your outdoor spaces to use and driving up the visitor satisfaction as well as your property value. It is often overlooked but one of the most cost effective ways to maximize a company's profit and help turn limited capacity and seasonal income into year round bustling service. And it is our passion to maintain our status as one of the most trusted Screen Enclosure companies in Fort Lauderdale by getting you the best quality of service at excellently low prices!